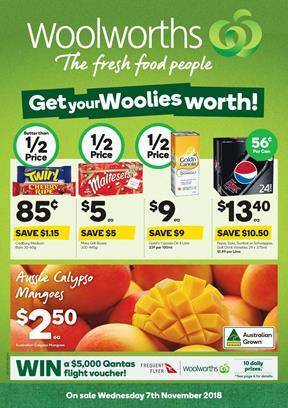 Woolworths Catalogue Grocery 7 - 13 Nov 2018 featuring the latest pantry products such as Old El Paso taco sauce, Riviana Basmati Rice, Extra Virgin Olive oil, Sun Rice Street snack, and more at half prices. See the whole catalogue for many more products from different categories. Pantry sale begins on pg 7. Moccona coffee, Twinings English breakfast tea, L'Or, Nescafe Blend 43, Nestle Milo, are all on sale. South Asian food is generally a part of the grocery stores like Woolworths and Coles. The cuisine is tasty, heavily spicy, and as quick as possible designed for most hard working people or customer who doesn't like to cook. Of course, this doesn't cover the ingredients. I am only talking about packaged meals like noodles. Especially for students, it's a great food for time save and money saving. Check out fresh fruits including mango, blueberries, apples, tomatoes, and potatoes. The delicious meat sale of Woolworths can be seen on pg 12. Australian lamb forequarter chops, lamb rump steak, beef porterhouse steak are featured in this sale. Don't miss out anything from the latest product range of Woolies. Australian grown meat is on sale at Woolworths. Deli-bakery shelf is perhaps the most delicious looking category of the Woolworths Catalogue this week. Find the best ideas of food there. Donuts, cookie varieties, mince pies, Helga's wrap and many more are featured. Favourite ice cream brands, more candies, and simple foods are on pg 20-21. I recommend the half-price sale on these pages. It's a profitable sale regarding more than 5 items are half-price deals.